It’s only been seven weeks interning here at NBC’s Golf Channel and already it has changed my whole perspective on being an artist, a professional, the corporate world and my place in it. The internship opportunity really just fell into my lap. I was working full-time at Trader Joe’s as a sign artist and quickly realizing that unless I wanted to be a store manager it wasn’t going to get me very far professionally. On my first stab of online job searching, I found this Digital Design Intern position in the marketing department of Golf Channel. It was on Indeed.com so I didn’t take it too seriously. I applied online thinking nothing of it until I got a call back the next day. After an extensive interview process, they offered me the job and I happily took it. Although I enjoy it, I never really considered a career in digital arts and since I didn’t major in graphic design I didn’t think I would be qualified. Luckily, I got my foot in the door at a great company and I’m realizing this is what I want to do. Working under the marketing department, as opposed to the creative services or print departments, has been a really unique opportunity. Instead of just receiving creative requests, I get to be a part of coming up with the concepts as well and how that translates into their marketing strategy. NBC was ranked among the top 10 companies for paid internships in 2015 and I can see why. They don’t treat me like an intern at all. I’m expected to attend meetings, creative brainstorms, manage my own time and projects, independently communicate with other departments and work on graphics that are live on our website, on air, and all over social media. 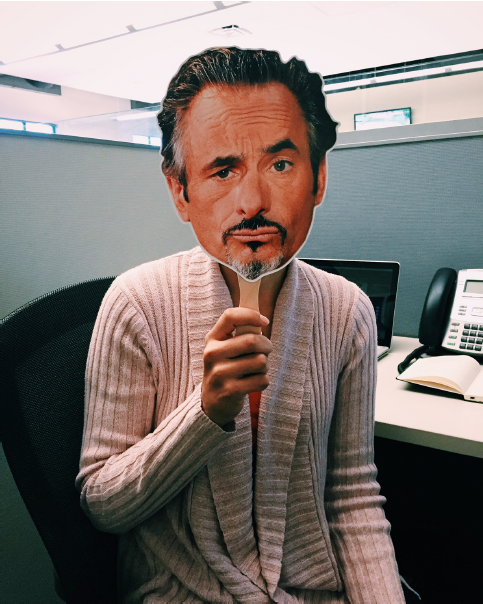 One of our on air talents, David Feherty, stopped by my desk one time…..
My first project was a parody poster of the Oscar nominated movie ‘Birdman’. 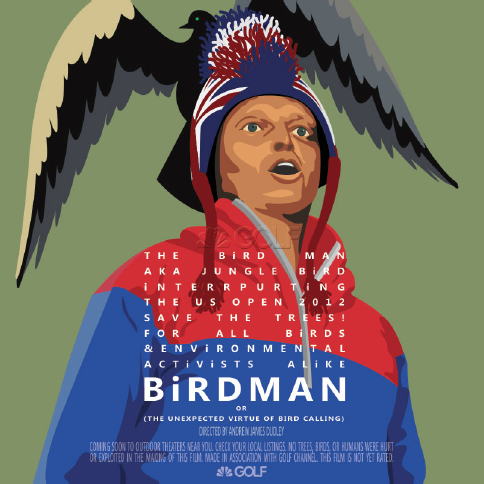 In 2012, and environmental activist interrupted the US Open ceremony by making bird calls and was forever known in the golf world as the Birdman. This was a great opportunity for marketing to relevantly insert ourselves in the Oscar’s trending conversations on social media. My parody poster was pushed live on our social media handles and the Birdman himself and Webb Simpson (the professional golfer who was interrupted at the US Open) retweeted it. It was a pretty cool feeling seeing my artwork on Golf Channel. 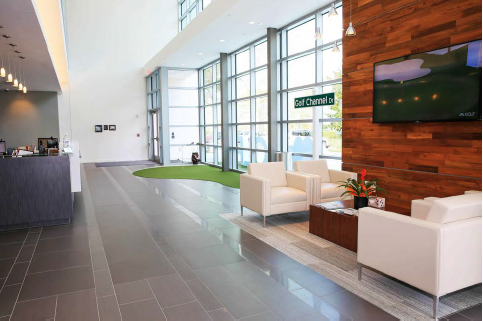 Since then I’ve designed graphics for the NCAA Golf Championships, advertisements for Top Golf that aired on TV and every Top Golf location, social media promotions, email headers for all our weekly newsletters and more. I feel like I am getting a very real experience of what it’s like to be a corporate designer and I have no doubt I’ll be prepared for a real position when this internship is over.